Bluebird Arts – Chicago's only English-Russian Theatre Company – proudly announces dual productions of Zoyka's Apartment by Mikhail Bulgakov to close its 2015-16 Season. Artistic Director Luda Lopatina Solomon will direct both productions. ChicagoZoyka’s Apartment is a tragic farce in two acts. The play revolves around Madame Zoyka – a smart, bold and pragmatic woman who turns her apartment into a dressmaker’s shop in order to survive Post-Revolution Soviet Union. At a time when the country is seething with economic discontent and everyone is scrambling to escape to Paris, Zoyka is frantic to save as much as she can before the opportunity disappears. 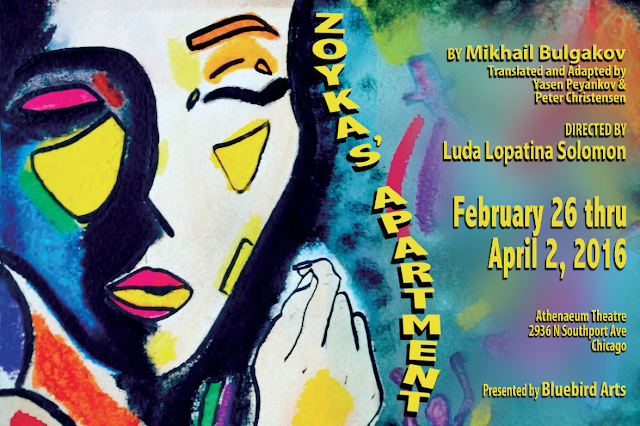 The Russian production of Zoyka's Apartment will be identical to the English Version production, save an all Russian-speaking cast. More information regarding this production will be released as it becomes available.Founded in 2014, Bluebird Arts is a nonprofit organization whose purpose is to enrich, educate and entertain our community by sharing intimate stories of the human condition, focusing on the genuine problems of real people. Bluebird Arts showcases Chicago's talent by promoting cross cultural exchange, taking Chicago theatre and artists to Europe and bringing European theatre, to the Chicago community. They serve both the English and Russian speaking populations by producing plays in both English and Russian and translating English language plays into Russian and Russian language plays into English. Bluebird Arts will continue to collaborate with Russian arts organizations such as Theatre Volhonka in Ekatirenburg, Russia. For more information about Bluebird Arts call 773.526.3628. Or visit their website at www.bluebirdarts.org.